The communities along the SR 520 corridor between I-5 and the Eastside boast a rich cultural heritage within a diverse and abundant natural setting. From waterways to highways and canoes to trains, this area has been home to ever-changing communities, neighborhoods, industries and innovations. 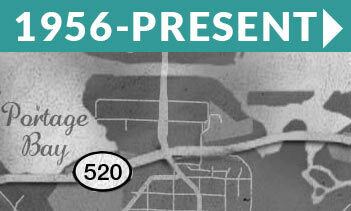 520history.org is dedicated to the history of the communities, industries, and landscapes that have developed throughout the SR 520 corridor. 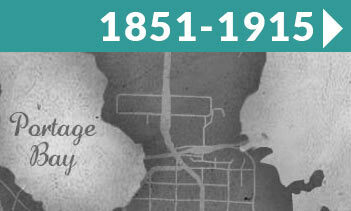 This website is a component of the SR 520 Bridge Replacement and HOV Program, and was developed as an educational resource as part of Section 106 of the National Historic Preservation Act (pdf 1 mb). 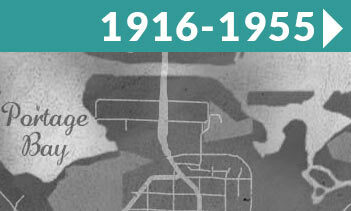 The SR 520 bridge is also documented in the Historic American Engineering Record of the National Park Service. Browse the pages of this website for an in-depth look at 13,000 years of history, from early tribes to bustling communities on both sides of Lake Washington. 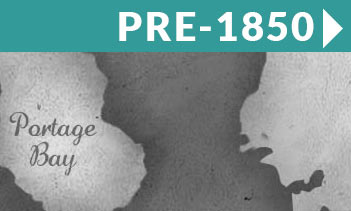 You’ll learn about early settlements, major changes to the natural landscape, and transportation infrastructure and bridge construction that facilitated population and employment growth. To learn more about the SR 520 Bridge Replacement and HOV Program, please visit the SR 520 Bridge Replacement and HOV Program website.